This is my first Wendy Higgins book, so I can't compare this one to her Sweet series, or her self-published novel. I can say that I was pretty pleased with this book, despite its crushing ending. (Sorry! It gutted me though.) What is holding me together (and making me not rate this book down) is the fact that this is book one of two, and I'm almost 90% confident in Higgins not to steer me wrong in terms of certain... things. I'm taking a leap of faith, I suppose. Lochlanach is under attack, by a strange and dangerous beast that has been attacking at night, ripping soldiers and villagers to shreds. 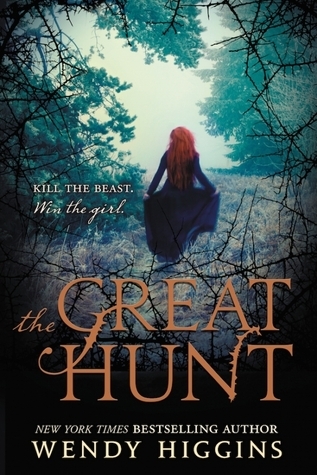 The king is desperate; with his oldest daughter's reluctant permission, he issues a proclamation that whichever hunter kills the beast will have his daughter's hand in marriage. Aerity always wanted to marry for love, but she knows the safety of her kingdom is more important. But she can't help falling for Paxton Seabolt, a mysterious, grumpy, brooding hunter who is bent on killing the beast to protect his family and Lochlanach (i.e. not for her). Paxton isn't all that he seems, but then, neither is the beast, or what is really going on in Lochlanach. I've never read "The Singing Bone", but I have a huge copy of the works of the Grimm Brothers so I will definitely be reading it when I get the chance! I love fairy tale retellings, and I'm sure Higgins did a beautiful job of twisting the tale into her own story. I thought the world-building was well-written! I love how this book starts - in a horrifying, eye-opening way. A true hook, in my opinion. I also really like how important family is, in this book! The king has three kids (Aerity, Vixie, Donny), and his two younger sisters have an army of kids as well. The oldest cousin is Wyneth, who is one year older than Aerity, and whose betrothed was killed by the beast. Wyneth has been in mourning, but clear how much Aerity and Wyneth love each other and are best friends as well as cousins. Their friendship is so strong, throughout the book! This book is written in third-person limited, so we get Aerity's third-person POV, and Paxton's. I liked Aerity, though at first I didn't really connect with her. She's a good person and a selfless princess. I love how much she cares about her family, and her kingdom. I liked Paxton almost immediately - grumpy, silent, and somewhat moody heroes are my favorite. Especially the ones who are noble and yet have something to hide! Paxton is a fierce hunter and a selfless, brave man. He and his younger brother, Tiern, enter the Hunt, but both are more concerned with killing the best than marrying the princess. I have seen a lot of people struggle with the pacing, or the writing, but I personally didn't have any trouble reading this book. I'll admit, the beginning, after the first scene but before the hunters gathered for the Hunt, I had to muscle through a bit. But once the Hunt was called, I was zipping through this book. The romance is so sweet! It's the slow-burn type, and kind of hate-to-love, which are two of my favorite tropes in romances. I say "kind of" hate-to-love because the attraction is instant, for both Aerity and Paxton, but Paxton is doing everything he can to avoid Aerity, and Aerity is convinced that Paxton does not like her. Nevertheless, I liked the romance; no love triangle, and it's a pretty straightforward romance, at least until the ending. You'll see my thoughts on the ending in the next section. The climax of this book something that I both dreaded and looked forward to - and I got exactly what I was expecting. Higgins ups the ante, and she sets up a bigger picture for book two really well. Of course, I abhorred the ending (you'll understand why - vaguely - in the next section), but Higgins did a good job of writing the ending. The ending makes sense, even if I hated it. Okay fine, I hated the ending. It's a huge cliffhanger, in terms of several different aspects. The Hunt has just gotten super complicated (trust me, this is VAGUE), a new player has entered the game, and the romance... oh my heart. Just thinking about the proclamation, and the whole premise of this book - you can probably figure out why I hate this ending in terms of the romance. If this book ended with all of the OTHER cliffhanger aspects MINUS what happened in terms of the romance, then I would give this book five stars, hands down. But it's getting 3.5 stars - which I am willing to round up to 4 stars - because of that cliffhanger. Despite the cliffhanger, I enjoyed the entire book. It's one of those cases in which I LOVED the book up until the ending. What's keeping me strong is that I'm pretty sure Higgins loves a good HEA, and she wouldn't have spent so much time in those two specific characters' heads otherwise... right? Maybe wait until book two publishes, to binge-read the series. Man, I love duologies. Though the wait is still the same, for the next book, it's only one book to wait for! 3.5 stars -> rounded up to 4 stars. I'm hoping that there will be a good ending to the series! I think I trust Higgins with this HEA but... I'm pretty anxious now! Still, she has guaranteed at least one person who can't wait for the sequel, because of the ending of this book! I haven't! I heard love-triangle-y things and I was like nope nope nope. I hope you have a lovely time! OOoh nice! I wasn't really interested in reading her Sweet series. I read one review that discussed some things and it was all kinds of things I hate in my YA reads, so I just avoided it. But this...this sounds like one I will enjoy! I love fairy tales and fairy tale retellings. I read the complete works of Grim some odd years ago, but I might need to get a refresher on this particular tale! Glad to hear you enjoyed this one up until the ending. Now I am left speculating just what kind of curveball Wendy threw at us to make you so shocked and take the rating down because of it! And the bigger question is do I torture myself with waiting to read this until the second book comes out...or do I torture myself and read it anyway and die waiting for the second book. Either way, it's safe to say I am torturing myself! LOL! I know how you feel! I remember something about a love triangle and decided to stay faaaaaar away. The ending is not horribly painful like some cliffhangers endings that I've been privy to over the past few months, but it's still pretty mean. So cruel, really. I wasn't surprised but at the same time, I did NOT want that ending to happen! Slow burn and hate to love? I'm so in! I read the first book in her Sweet Evil series and wasn't a fan and never finished the series. But this sounds more up my alley. The romance in this one was lovely! But like... the ending... Nick, it's been such a bad year, in terms of cliffhanger endings. 2016 = the year in which authors resort to awful cliffhangers in order to hook us into reading the next book. UGH! Well, I love a good fairy tale retelling but...I think you're right. Best wait until the second half is out to see whether I'm still interested before investing. Great review, Alyssa! YES. I kind of wish *I* had done that. There weren't a ton of reviews by friends, and no one warned of the ending of this book... well, anyway. *I'm* here to warn you all! I know. :( 2016 is KILLING me, with these cliffhangers! Ok you need to tell me what happens at the end in terms of the romance! Yikes. Maybe I need to wait for book 2 and read them together. This is a duet, yes? Otherwise, I'm glad you enjoyed this so much. Hate to love romance is my most favorite. I definitely will! Let me spill tomorrow. The romance was a big part of that cliffhanger. -_- I think binge-reading the series is definitely a smart move, it'll help with your enjoyment of the duology. Two books indeed! Less waiting, which is nice. I hope you enjoy the series, Lauren! Ahhh! I had no idea this was going to be a killer book! I have an eARC, I think I'll be reading it soon! Read it! It's soooo good, but the ending. *sobs* I hope you love the story, Lis! Girl! I hope you enjoy this one! To be honest, I've either seen some five-star reviews, or some DNF ones. So I'm not sure what to tell you BUT watch out for the ending, if/when you read the book. Mentally prepare yourself! Ohh I am glad you liked this one, it is probably going to be my next book! I am scared for the cliffhanger though- I just finished a book in which the ending (it's a series) nearly did me in hahha. But, with goo world building and a sweet romance, I think (I hope!) I can handle the pain. Maybe ;) Great review! Oooo, what book?! Dude, 2016 is killing me with these cliffhangers. I hate them! But this book was so good (until the ending). I hope all ends well! Glad to see that you liked this one. I've not read this author yet, but this one sounds so good! Great review! It was delightful! Minus the ending (which I'm trying to get over, lol). Thank you, Lisa! Awesome review Alyssa! Yay I am so glad and happy you really like this book! I haven't read any books by Wendy Higgins yet, but after I reading your great review I just know I am really going to love and enjoy her books. Plus I heard nothing but amazing reviews about her books. Thanks for your awesome post my friend! HAHAHAHAHA I can tell you right now that he most certainly is NOT dead. ;) I'm sure everything will even out in the next book! I just HATE cliffhangers. I'm definitely staying away from this one until the second book is released! That ending sounds terrifying. >.< At least it's just a duet, so I won't have to wait long. Glad you enjoyed this for the most part! Hopefully the next one won't be a disappointment! I think binge-reading the series might not be a bad idea! And yup, duology for the win. Thank you! I loved Wendy Higgins books so I was sure I was going to like this one. (I did, but it had its quirks) Slow burn romances are the best (That are how her other books are *mostly*) and I loved the romance between Aerity and Paxton but the ending shattered and ruined my heart. I need book two, and I hope that Wendy will be fair and stay on the right track with the romance. I hope she'll stick with this romance too! I can't see that NOT happening, given that we're reading exclusively through Paxton and Aerity's minds... I'm pretty optimistic! I love Wendy's books and I adore this one, despite the horrible heartcrushing cliffhanger! Thankfully, it's a duology! I know! I'm really liking the duology trend these days. So much less painful! Hmm, the romance, I did enjoy the hate-to-love, haha. I'm so glad this is only a duology! I really need the next book now! Great review, Alyssa! Spot on review! Totally loved the book until the horrible ending. Hate cliffhangers especially when I have to wait a whole year for the next book. Thankfully I see Pax coming back to help kill the other beasts but fingers crossed that the wedding doesn't happen. I'm glad it s duology. Sometimes I forget what happened in the previous books since its been too long of a wait. I loved her Sweet series. There's really not a love triangle I don't think. It was so long ago when i read it though. Thanks for always writing such great reviews!